OJ Simpson has been found guilty on 12 charges of armed robbery, conspiracy to kidnap and assault with a deadly weapon by a court in the US city of Las Vegas. The former US football star and actor was accused of robbing two sports memorabilia dealers a year ago. The armed robbery charges carry a mandatory jail sentence, and kidnapping carries a possible life term. Simpson, 61, who denied the charges, was acquitted of murder in 1995 in what was dubbed “the trial of the century”. The charges in the latest trial centred on an incident in the Palace Station hotel in Las Vegas in September 2007. Simpson was accused – and convicted – of kidnapping two sports memorabilia dealers and holding them in the hotel. 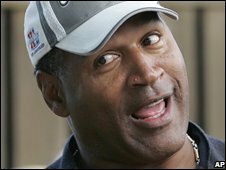 The former National Football League running back seized the pair in an attempt to reclaim items in their possession related to his sporting career, which Simpson claimed still belonged to him. Asked by reporters on his way into court for the latest verdict, which was read late on Friday night local time, Simpson said he was prepared for the judgement. “You gotta be ready,” the former Buffalo Bills star running back told journalists. Inside the court both Simpson and his accomplice, Clarence Steward, were found guilty on all charges by the Las Vegas jury. Simpson blew out his cheeks and nodded as the verdicts were read out. He was then led away with his hands cuffed by police. He will be sentenced in December. The judge refused to grant him bail pending sentencing. In his previous trial, Simpson was accused of murdering his former wife Nicole Brown Simpson and her friend Ronald Goldman in 1994. The not-guilty verdict came 13 years to the day before his conviction in Las Vegas, and shocked many in America. Mr Simpson was later found liable for the deaths in a civil case and ordered to pay $33.5m (£19m) to Mr Goldman’s family.